28 April 2015 oleh Ir. Harman L. Tosaleng, M.T. 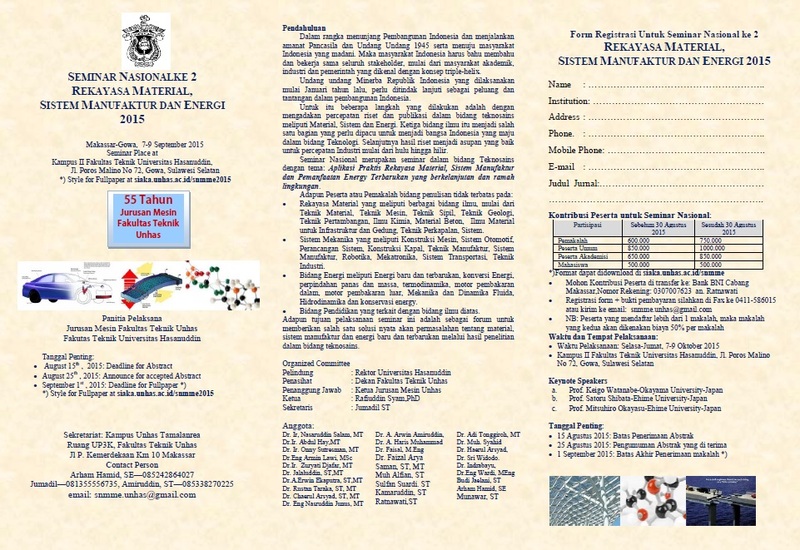 International Conference on Material, Manufacturing and Mechanical Engineering – ICMMME, is a biennially conference organized by the Department of Mechanical Engineering, Lambung Mangkurat University (UNLAM), Banjarmasin, Indonesia. ICMMME 2015 provides opportunities for the delegates to exchange new ideas and application experiences, to establish business or research relations and to find global partners for future collaboration. 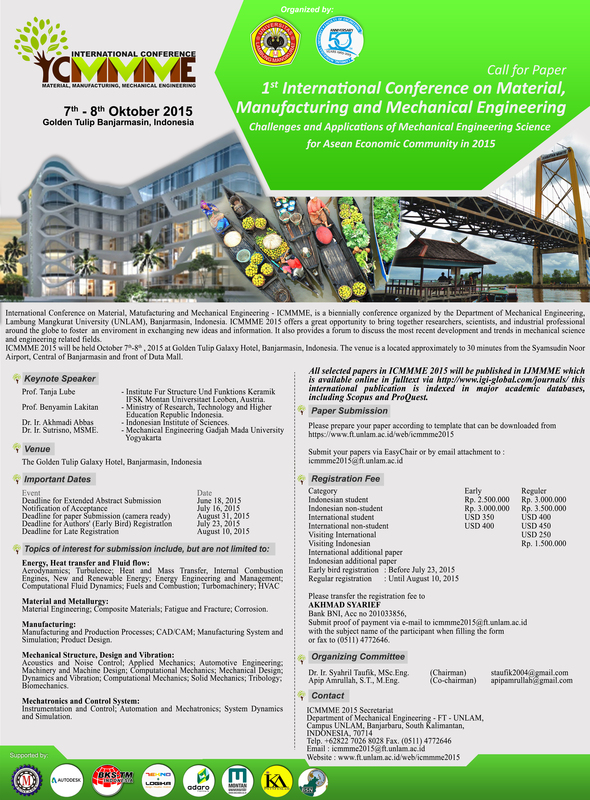 ICMMME 2015 will be held October 7th-8th, 2015 at Golden Tulip Galaxy Hotel, Banjarmasin, Indonesia. The venue is a located approximately to 30 minutes from the Syamsudin Noor Airport, Central of Banjarmasin and front of Duta Mall. Material and Metallurgy: Material Engineering; Composite Materials; Fatigue and Fracture; Corrosion. Manufacturing: Manufacturing and Production Processes; CAD/CAM; Manufacturing System and Simulation; Product Design. Mechanical Structure, Design and Vibration: Acoustics and Noise Control; Applied Mechanics; Automotive Engineering; Machinery and Machine Design; Computational Mechanics; Mechanical Design; Dynamics and Vibration; Computational Mechanics; Solid Mechanics; Tribology; Biomechanics. Mechatronics and Control System: Instrumentation and Control; Automation and Mechatronics; System Dynamics and Simulation. 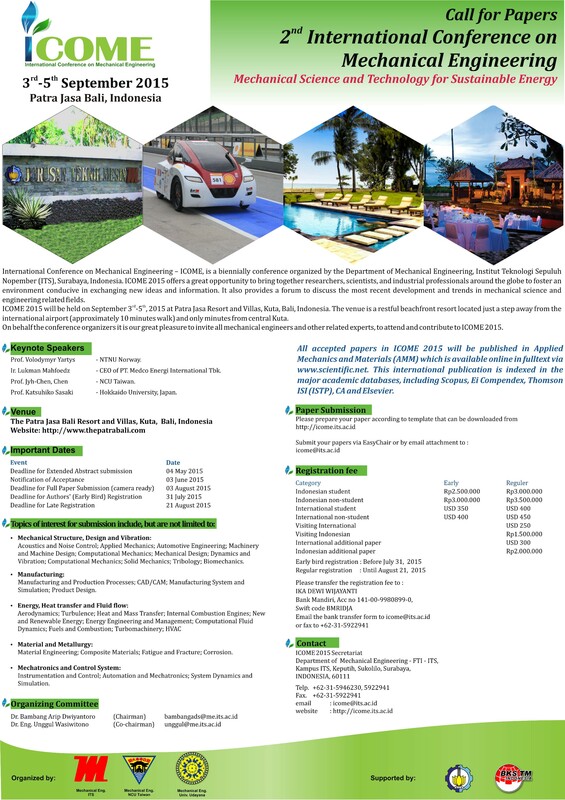 International Conference on Mechanical Engineering (ICOME), is biennially conference organized by Department of Mechanical Engineering, Institut Teknologi Sepuluh November (ITS), Surabaya, Indonesia. ICOME 2015 offers a great opportunity to bring together researchers, scientists, and industrial professionals around the globe to foster an environment conducive in exchanging new ideas and information. It also provides a forum to discuss the most recent development and trends in mechanical science and engineering related fields. ICOME 2015 will be held on 3 – 5 September 2015 at Patra Jasa Resort and Villas, Kuta, Bali, Indonesia. The venue is a restful beachfront resort located just a step away from the international airport (approximately 10 minutes walk) and only minutes from central Kuta. All accepted papers in ICOME 2015 will be published in Applied Mechanics and Materials (AMM) which is available online in fulltext via www.scientific.net. This international publication is indexed in the major academic databases, including Scopus, Ei Compedex, Thomson ISI (ISTP), CA and Elsevier.